"Baobab Marine in Fiji has a very funny name, but do not let that throw you off. LOL. Baobab Marine is a very professional agency that I can highly recommend. This is the second time we have worked with Baobab and they have become a very valuable asset to our complex program. 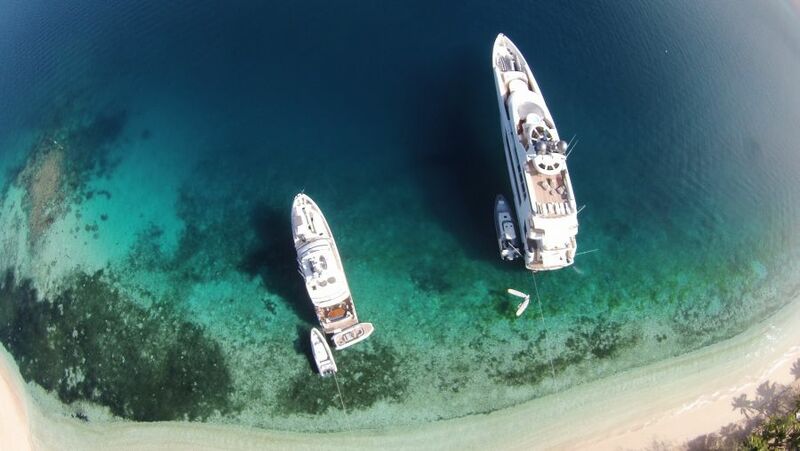 The team at Baobab will assist with making your charter go flawlessly from start to finish, can organized repairs for anything and they are pleasure to work with. Always professional, helpful and work to make it happen for their clients. If you want to make your life easier in Fiji, then use Baobab." "On a separate note I am aware of the fact that I have been using Baobab for all our work and I would just like to say that you have been excellent. We are coming back to Fiji yearly now and I would love you guys to agent for us in the future. I'm only gutted I didn't find you earlier." "I would like to thank Angel and the team at baobab marine services who helped with provisioning around Nadi it was so helpful and gave me an insight to the culture of the Fijians. Come visit soon and happy sailing." "I wish to take the time to thank the team at Baobab Marine for a successful 2015 season of cruising in the Fiji Islands, along with all the excellent repair and maintenance work completed on the dock in Port Denarau.With the workshop right there we always felt 'looked after' and the quality of the repair and maintenance work was first-class. The team was very efficient in the procurement of parts and I appreciate the hard work in finding a long list a spare parts for us in such a timely fashion! A special thank you to the super-yachting team who always went 'above and beyond' to fulfill even the smallest of tasks with a big smile on their faces. No request ever seemed to big or too small for this very efficient team." "I arrived to Fiji in July 2015. I had some problem with my batteries and watermaker. I contacted Baobob Marina and they did find the problem with the watermaker and did fast fix a new pump and they did get that on the warranty on my Spektra Watermaker. They did also measured the batteries and find that they were more or less gone. I orded new batteries from New Zealand and Boabab help me with the freight and clearing and did an excellent work to get in the 12 new batteries. When I did come back to Fiji after being home in Sweden I found problem with my generator and belt. I ordered new parts via a Volvo Penta Dealer, but when the part did come, it was the wrong part! Again Baobob did an excelent work and did rebuild the wrong parts so I could use it! All the technican at Bilbab have always a smile on there lips and doing a great work! Christine is very helpful and have assisted me and it has been a pleasuire to deal with them! I will miss you all but looking forward to be back in 2 years from now!" 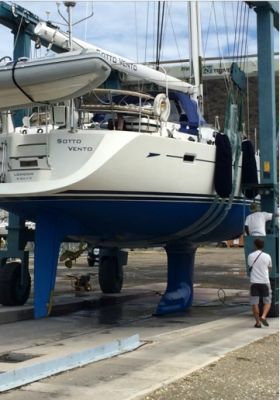 "S/Y Sotto Vento has just been lifted in Antigua. The anti fouling is great you wouldn't think it is nearly a year old and gone two thirds of the way round the world not a bit missing could do another season! Thank you for doing such a good job." "The 90 meter three masted schooner 'Athena' spent several months in the beautiful waters of Fiji during 2010. She cruised far and wide in the group and the widely travelled owners rated one of their finest cruises to date. So did the crew! Operating a large vessel such as ours in remote locations is never a simple task and there are many logistical challenges to overcome. We firmly believe that the team at Baobab Marine gave us the necessary back up, local knowledge, and above all the commitment to see things done correctly and done promptly. In an area known for its relaxed 'island time' pace it was nice to see that things could happen quickly when required. We had some mechanical issues with our tenders when away from the main centres and Michelle and Brian and their team were instrumental in sourcing the necessary spares and arranging their transport to a remote reef in the Lomaiviti Group. We eat well onboard 'Athena' and Dee competently liaised with our chefs to ensure fresh produce reached the ship when required. She also advised us on the various attractions and entertainments available in the villages. 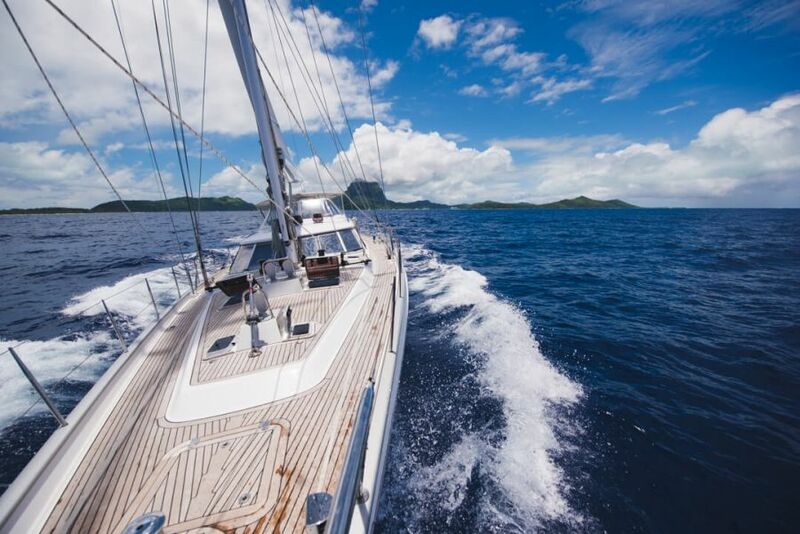 As a superyacht destination, the Fijian Islands have now been discovered and should you ever want to experience a little slice of the south Pacific paradise then you would be hard pressed to find a better shore support crew than Baobab Marine. "Just a short note to thank you for doing such a fine job for the "Lady D" and the crew..."
"We are writing to once again express our gratitude and thanks to the management and staff of Baobab Marine for a job well done. We are delighted with the new engine and the highly professional installation that went with it. While this was not the first time we had engaged your services, it was nevertheless a major production and our past experience with you made us feel very confident in the final result. 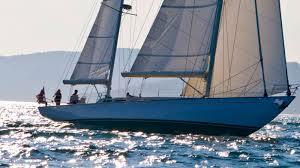 We all know that yachties think they have a right to 'cheap, fast and good' in that approximate order. We'd prefer to say that Baobab gave us a high-quality job commensurate with the time to accomplish same at a very fair price." "Thanks very much for your help in getting this outboard to us out here in Savusavu. Your service is excellent and your price as good as we could find anywhere." "...For those folks who are considering having some boat work done I will give Baobab Marine at Vuda Point a high recommendation. Brian Smith, the owner, runs a meticulous operation. His shop is a first class organization and his people are very good and have a great attitude....the engine installation was as good as I might expect from KKMI near San Francisco or Windward Yacht Services in LA which I consider to be two very good yards..."
"...By this small mail we wish to show our gratitude. During our trip which started in France we have had to make some repairs on the boat in different places. Our experience with Baobab Marine at Vuda was excellent, even the best. We were surprised to find on an island in the middle of the Pacific a company with many equipment and skills under one roof. In addition your team is very friendly and happy and obviously very proud to work for the company. Certainly because you were sailors yourself you understand what sailors need and dream to find..."
"S/V Aldebaran arrived in Vuda Marina in August of 2007 with a long list of boat repairs and a major time constraint. It was with great pleasure that we were introduced to the gentlemen at Baobab Marine who were so proficient and punctual that all major repairs were completed ahead of schedule and to exceptional quality standards, including a last minute bronze brazing job when an essential water manifold became damaged and began leaking less than 24 hours before the slated departure. This reference was written without their knowledge or consent, and I hope that it will encourage them to maintain their professionalism in providing services to the marine industry. Although I expect they have no trouble attracting business, I also hope that this message will point traveling yachts in need of repairs in the right direction. When you are circumnavigating the globe by sailboat, you develop an eye for outstanding marine services and how valuable they are. Baobab has our complete endorsement, and we look forward to doing business with them on our next time around." 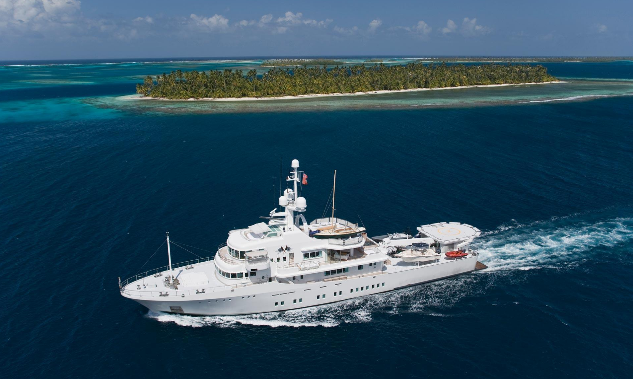 "Baobab industries were involved in several projects aboard Bel'mare, including the replacement of damaged teak on the aft deck, installation of strong points in the deck to accommodate pad-eyes, paint touch ups and some stainless steel fabrication. The work was carried out in a professional manner to a high standard within tight time restrictions. Brian was constantly aware of progress on-board and managed his team well to complete daily work lists. I have no hesitation recommending Baobab industries as a reliable and efficient maritime support company." "....we just thought we should drop you a quick note with some feedback on our recent haul-out for our 38ft cutter Maunie of Ardwell. We were originally planning to haul out on our return to Opua but a rattle from our feathering propeller made us change our plans and we are now very pleased that we did. Your team was outstandingly helpful and our experience was generally very good. Compared to other yards, your guys (and those in the yard who managed the lift-out and re-launch) were friendly and interested in our boat, even though we were a tiny project compared to the superyachts you normally deal with, we were never made to feel like it and experienced none of the usual disinterest and time pressure to get to the next boat in the queue. We plan to return to Fiji next season and will hope to use the yard for our maintenance lift-out next October..."